Monero [XMR] was one of the coins that suffered the wrath of the bear’s claws, as downwards momentum is the rule of the day. However, a crucial support is holding the price in a reasonable position. The one-hour graph for Monero demonstrates an uptrend from $100.8 – $102.0, with a crucial support at $100.8. Downtrends are seen at $104.4-$101.3, with a resistance level set at $111.6. 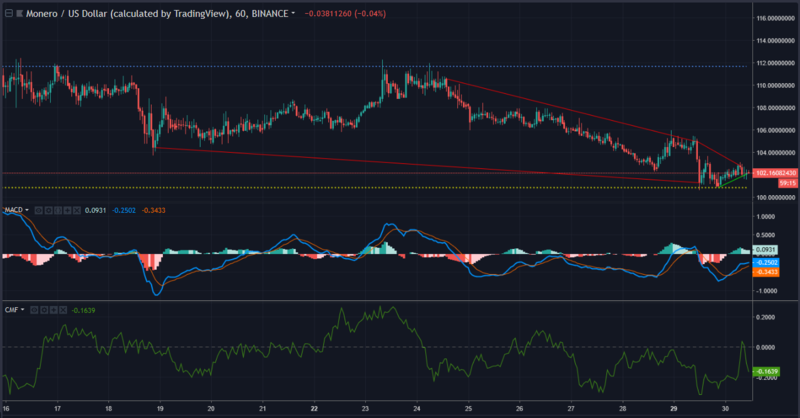 The MACD is showing a bullish crossover after the drop yesterday. The Chaikin Money Flow indicator recently went past the 0 line, but reverted to being negative after the sharp downwards movement exhibited by the price. The long-term outlooks show a short support uptrend from $98.7 – $100.5, with a downtrend seen from $268 – $103.9. Supports are present at $97.7 and $84.1, with a resistance at $138 and $123.9. The RSI is showing a balanced attitude between buying and selling pressure. The RVGI is demonstrating bearish crossover recently, with the lines set to meet again. The Parabolic SAR is showing a bearish signal, as seen by the presence of the dots below the candlesticks. The price of Monero might see a small hike in its price as a correction post the drop on October 29. However, most indicators are predicting a downwards movement, with the bear holding the coin in its long claws. 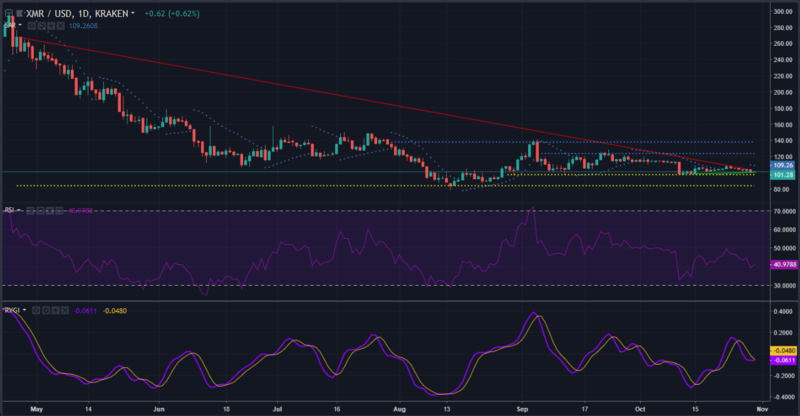 The post Monero [XMR/USD] Technical Analysis: Bear attack leaves coin on the floor as support holds price up appeared first on AMBCrypto.